Looking for emergency transfer of a patient from Patna to Delhi? 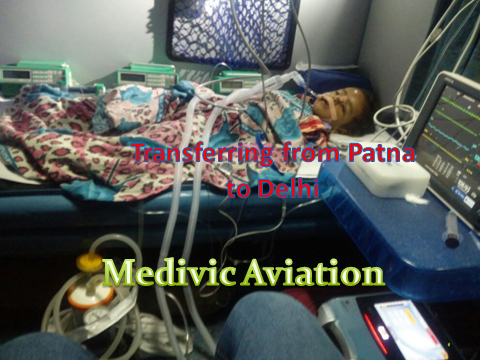 Medivic Aviation is top Rail/Train ambulance service provider from Patna, Bihar. We transfer the patient in train ambulance with ICU facilities. We take the patient from the hospital in our own ambulance then we shift patient in best and fastest train. Medivic Aviation team transfer patient with advance life support system such as Ventilator, Cardiac Monitor, Infusion pump, suction machine, BP apparatus, oxygen cylinder and etc. with trained paramedic team. Rail ambulance cost is low (60, 000-1.10 Lac) as compared to an air ambulance. We provide same facilities just like in any ICU setup.Medivic Aviation company always ready and shift the serious patients one city to another hospital with the full Emergency medical facility.